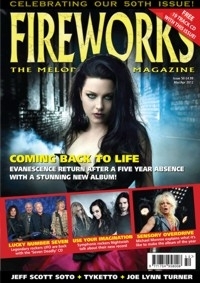 Hitting it's 50th landmark issue, Fireworks Magazine brings you another packed edition, featuring a double page interview with the returning Evanescence. Michael Monroe tells us what it's like to be the winner of the Classic Rock Awards 'Album of The Year' and Jeff Scott Soto candidly explains his reasons regarding his much anticipated return to rock with 'Damage Control'. As if 23 interviews and all the latest albums, DVD's and books reviewed weren't enough, there is also a fascinating insight into the story behind Fireworks. On top of that, we also offer you a free CD containing 19 tracks, featuring the likes of House Of Shakira, Doogie White & La Paz, Oz Knozz, Bangalore Choir and many more. What more could you want? Fireworks #50 is out now! Click HERE to order your copy.